The A73E-AS31 is a mainstream notebook, suitable for everyday computing like email, web surfing, watching videos and social networking. 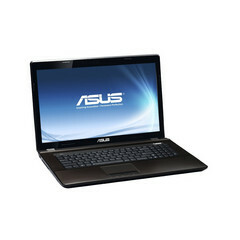 Manufactured by the Taiwan-based tech company Asus, this laptop is available for purchase on Amazon, priced at $515. Apparently, the A73E features a “classy metallic design” and comes outfitted with a 17.3-inch widescreen display of HD+ native resolution (1600-by-900 pixels). Furthermore, the device is driven by a second generation (based on the Sandy Bridge architecture) Intel Core i3-2350M central processing unit that incorporates two cores operating at a frequency of 2.3GHz. According to the product page, the notebook does not have a discrete GPU installed; instead the integrated Intel GMA HD video card will be accelerating all 3D graphics. Reportedly, the Asus A73E-AS31 comes loaded with 4GB of internal 1333MHz DDR3 RAM (up to 8GB), a 750GB rotating hard drive (5400RPM) and a DVD Burner. Connectivity-wise, users are provided with Ethernet LAN 10/100/1000, Wireless LAN 802.11 b/g/n and Bluetooth 3.0 modules. The portable PC also packs four USB 2.0 ports, 3-in-1 media card reader slot, an HDMI output, D-Sub and a 0.3MP web camera for video calls. The notebook is available in a mocha color, runs on a Windows 7 Home Premium 64-bit operating system and weighs 5.72lbs with the built-in 6-cell battery. Other features supposedly include Altec Lansing speakers, Asus IceCool and Power4Gear technologies that supposedly keep the system cool and optimized.